This is the third installment in a series of blog posts about the making of Healing the Warrior’s Heart, a public television special that presents a Native American perspective on the soldier’s experience, and explores the spiritual traditions that help returning American Indian soldiers cleanse themselves of war.Gary Robinson is Partnering Producer for the project, and has been collaborating with Taki since early this year. Gary is a Native American author and filmmaker who has worked with tribal communities for more than 25 years to tell the stories of Native peoples in print and television. As part of the production of Healing the Warrior’s Heart, he traveled to Joshua Tree, California, to videotape portions of a Soldier’s Heart training session for therapists and pastors. The Soldier’s Heart non-profit organization was created by Dr. Edward Tick and therapist Kate Dalstadt as a means of disseminating their work and helping to heal war trauma suffered by many veterans and their families. “As an American Indian writer and filmmaker, I’ve been working with tribal communities for many years to shine a light on the struggles, accomplishments and cultural truths of American Indian peoples. Some of my recent work has focused on the history of American Indian service in the U.S. military and provided a means of sharing the incredible achievements of Native soldiers and their cultures. Although I’ve participated in tribal ceremonies and veteran recognition activities on reservations across the country for years, I was not prepared for the profound teachings shared by Ed and Kate in this training session. I was only present for one day of the four-day training, but experienced an exhilarating sense of eye-opening hope in that circle of non-Native people. 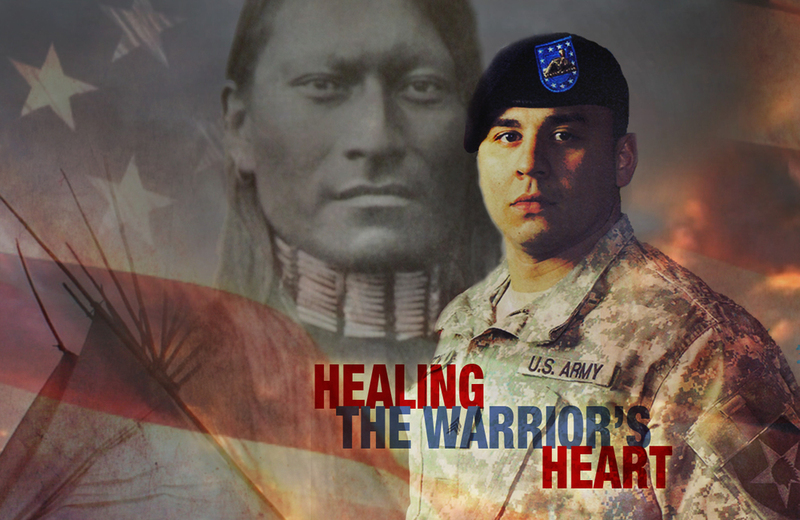 Drawing on the discoveries of Joseph Campbell and the cultural teachings of traditional Native American warrior leaders such as Sitting Bull, Soldier’s Heart has mapped out a valid model that successfully heals war trauma (known to most as Post-Traumatic Stress Disorder or PTSD) and gives the military veteran the tools for productive reintegration into society. Dr. Tick and his colleagues realized long ago that for a “warrior’s return” to be successful, the veteran’s family and community must be brought into the process. They’ve identified the elements missing from American society that prevent our nation from being able to truly help and heal our emotionally and mentally wounded warriors. One exercise conducted during the weekend training called for non-veteran participants to imagine themselves being deployed to Afghanistan with three of their closest loved-ones (friends or family). This parallels what soldiers experience as they bond with their band of brothers (or sisters) as they go through training and head off to war. Then, as the exercise continued, they were to imagine watching each of those people killed in action before their very eyes. In the final step, these workshop participants were then shipped back home without any opportunity for emotional cleansing after those devastating losses. Once home, they’re expected to “get over it” and “move on” with their lives. Such is the condition of every person who has experienced combat. This was but one of the many first-hand lessons taught through the Soldier’s Heart training to help future counselors learn to better serve the needs of veterans suffering from post-war trauma.